, and over the next week, we'll be highlighting some of our favorite holiday templates. 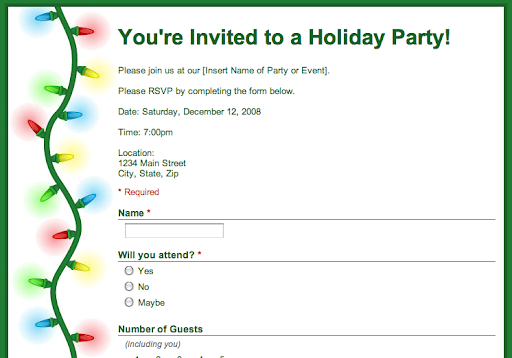 If you're planning a holiday party this holiday season, this Party RSVP form template makes it easy to gather the info you need without having to email back and forth with each person you've invited. As with all forms in Google Docs, your guests' RSVPs are automatically recorded in a spreadsheet connected to your form. If you want to use a different theme for your RSVP form, you can start from this template, and if you're planning a company party, try this template out. The Google Docs team is celebrating the holidays, and over the next week, we'll be highlighting some of our favorite holiday templates.